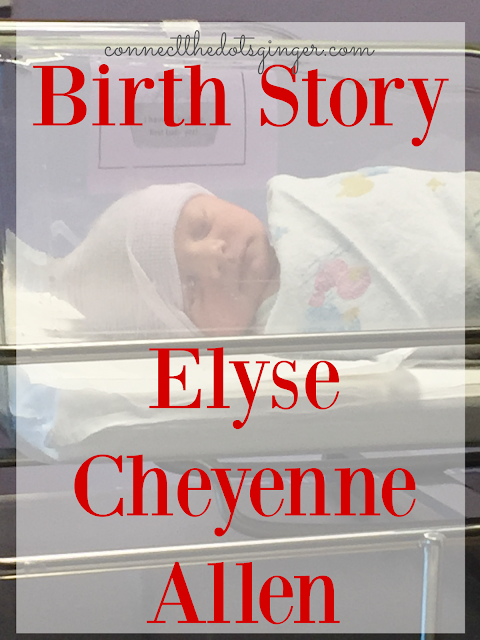 I finally have some time to sit down and write out Elyse's birth story! YAY! I never thought that I would carry her beyond 41 weeks. 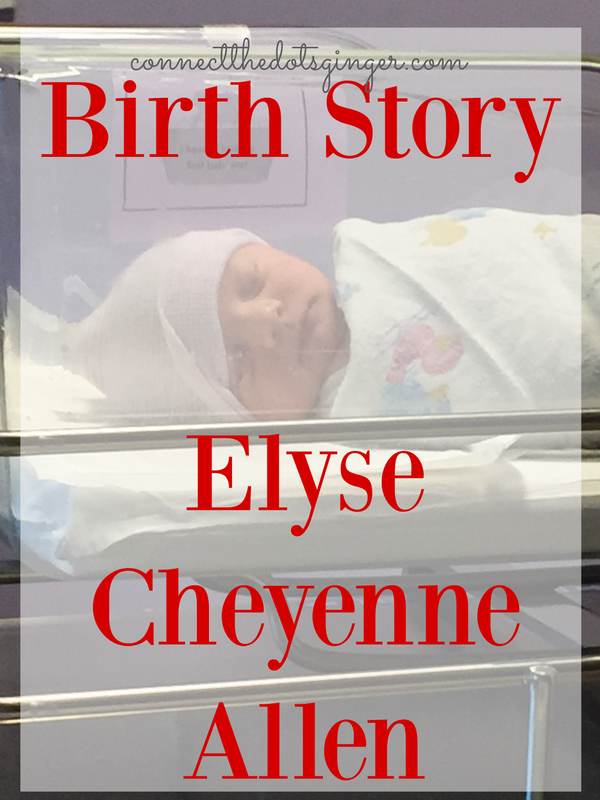 We thought for sure she would be born just after her due date. So when I hit 40 weeks and kept going it was a little frustrating. And when I passed 40 weeks and 5 days, the time I had Collin naturally, I was a bit disappointed. Plus my mom was here for over a week before she was born which meant less snuggle time for her since she had a flight back home at a specific time. At my 40 week appointment, I talked to my doctor and set up our induction date incase she didn't arrive before that point. The date was set for 41 weeks exactly. My doc did strip my membranes to try to encourage labor to come naturally. I was already 3 cm dilated at that point and almost completely effaced. He was convinced that I would go that weekend. And I didn’t. I did have a few episodes of regular contractions but they would just stop after I finished exercising or after I sat down and rested. Wednesday rolled around an called the hospital. They told me that they didn’t have any beds available for the induction because they had 4 c-sections that day. They advised me to call back around 10 to see if anything had changed. I called back and again they said that they didn’t have anything available and that they still had 4 c-sections scheduled. I pleaded with nurse saying I was 41 weeks pregnant and she said I just had to call my doctor. She did say that the next time I am scheduled that they will try to get me in since I had already been “bumped”. GRRRRR! I called my doc right away and told the nurse what happened. My doc was in surgery and would call me back as soon as he could. Just an hour later he called me personally and was PISSED! that I was denied my medically needed induction. He asked how soon I could get into his office so he could check me and do another “very aggressive membrane strip”. I told him 30 minutes and Matt and I were on our way. I kept telling Matt how upset my doc sounded over the phone and it wasn’t until we saw him in the office that we could actually see how upset he was. He was livid! He went to the L&D wing and talked to the head nurse. She said that they had my due date as 9/27 not 9/21 and thought it was an elective induction not a medically needed one. I had two reason why we had to get induced, 1 because I was a week over and 2 because of my placental abruption last year, they wanted my placenta to be as strong as possible to avoid a possible hemorrhage. Me in the middle of a "strong" contraction. Before all the fun started of course. While in the office my doctor did an exam: I was 4cm at that point and then did an insanely aggressive strip. IT HURT! He did say, I should just break your water right now but I want you to go naturally. And this should do the trick. He also sent me home with specific instructions to do Castor Oil. EWWWWW! This stuff never worked with my others. (it kind of worked with Collin, but I didn’t drink enough of it to induce.) This time he wanted me to do the full amount. 4 oz. Not going to lie. I was scared. That stuff is gross and the after affects are HORRIBLE! I told him I was not constipated and that I was already pretty regular. He said that this is purely to self induce labor not to clean me out. So off to the store we went to get some castor oil, orange juice and Reese’s Peanut Butter Cups. 4 hours later it was working it’s magic and I was having my first volley of a pure laxative at work. I made sure to drink lots of water and stay hydrated. 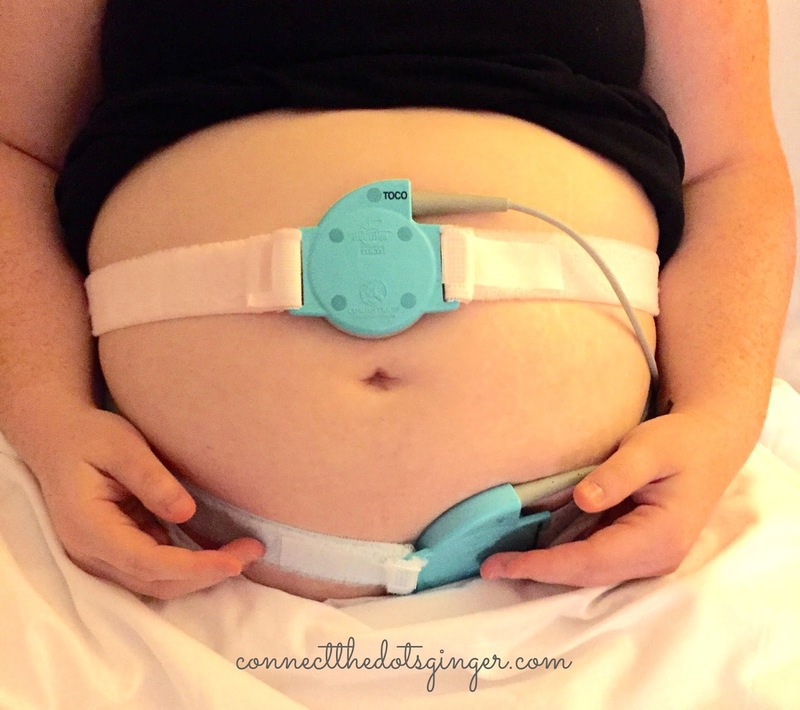 After 5 different times of it working no contractions. I knew it wouldn’t work and was just resigned that I would be in the hospital the next day for my rescheduled induction. I had to get up at 2am for my 6th visit to the bathroom, but things felt different. I was feeling contractions by that point. I started clocking them around 2:30am. They were consistent and getting pretty strong. And they were only 9 minutes apart. I woke Matt up by 3:20 and asked him to push the contraction timer as I wanted to get into the shower and just use the hot water in there. It seemed better to me than the tub. Over the next 40 minutes my contractions went from 9 minutes apart to 3-5 minutes. I would have a big one then a couple small ones. By 4am, we decided it was time to call my doc. Granted the contractions were not as intense as they had been with Collin when I called for him, but I honestly didn’t want to be at that point of them being that intense. I was too scared to have the baby in the car. Doc asked us to meet him at the hospital between 4:30 and 5am. So I got ready, changed into my birthing dress, let my mom know we were on our way to the hospital and off we went. Still timed the contractions in the car and they were a consistent 5 minutes apart. I was feeling fine. They were a little strong but nothing to make me wish against them. When we arrived at the hospital, we went to the ER and were escorted up to the L&D wing. He asked if I wanted a wheel chair and I opted to walk. On our way to L&D we ran into my doc and he was like, “You are not contracting.” I promised him I was but they weren’t that intense but they were 3-5 minutes apart. The hospital hooked me up to the monitors, asked me the million of questions they asked and the doc looked at my scans and sure enough, I was actually contracting every 2 minutes. He did an exam and I was 5-6 cm dilated. He was like, “Ok, it’s time!” And he broke my water by 5:15am. They had to keep me on the monitors for awhile longer to get a good baseline of what was happening. I hated that. I wanted to go into the bathroom and labor on the toilet. Because I do not like the feeling of stuff gushing out and just getting everywhere, but oh well! Finally after 40 minutes they started the tub for me and said I could get in. It was my sanctuary. I had my hypnobirthing positive affirmations on a constant loop and labored in the tub for awhile. The doc and I placed bets on when the baby would arrive. I guessed by 6am, holding true to my 3.5 hours of labors from start to finish. He said 6:30. I started getting very strong contractions in the tub. Matt was in there with me and helping me through them. 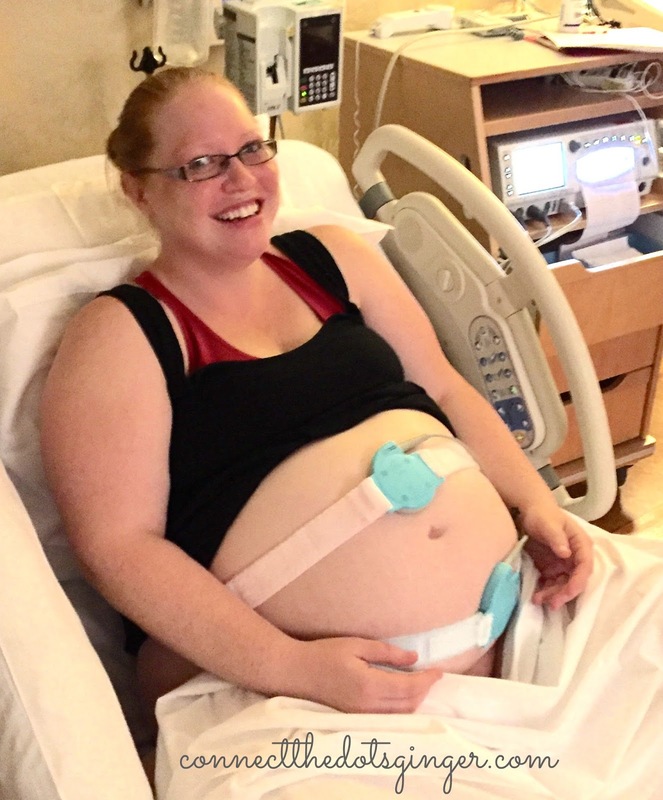 This was my first labor without a doula. After an hour or so I started to have pressure and a strong desire to push for a bowel movement which is a sign of baby coming out. I called the nurses in and they rushed in but before I could get out of the tub a push happened but the wrong kind. I literally had a bowel movement in the tub. I was mortified and frustrated and so upset. I thought it was the real deal but nope. I crapped in the tub. And honestly S*** happens during labor but not in the tub! COME ON BECKY! I had to get out of the tub at that point and that is when my contractions basically stopped. 7am and I stopped contracting. Doc checked me again and I was still only at a 5-6. I think I was further along until that BM happened and my body literally closed up and stopped. They had me walk the hallways to get them started again. We just walked the halls and then would rest for a bit in the room after and use the bathroom. Since my water was broken I was still leaking as I walked and that was uncomfortable! Matt went to go get some breakfast from the cafeteria and I stole some of Matt’s breakfast since I was starving and it was the best meal I had had in forever! Against the rules of course but I didn’t care. I was starving! After an hour and a half my doc found us and said, “Let’s just get this started again. Time to put you on pitocin. I know you don’t want to but they stopped and cydotec didn’t work for you last time. Let’s get this baby out!” So back to the room we went and strapped into the monitors again and an iv I went. I begged the nurse to let me not be strapped down in the bed. I actually thought that I could get up and move around while on pit, but the nurse said nope. So I was stuck in the bed. My worse fear! Ok…that is the end of part 1! This is already pretty long. Ready to read part 2? CLICK HERE! You can jump ahead and read my 1 week postpartum bump update! CLICK HERE!